Shoulder complaints are common in sports such as weight lifting, swimming, and throwing, or in an occupational setting requiring overhead work. In that context, injury, when not due to a single trauma, is often due to repetitive activity or overuse. These problems can often be linked to specific positional demands. 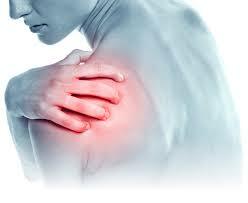 The shoulder may be the site of injury when a fall onto an extended arm transforms the shoulder into a weight bearing joint. Fracture, dislocation, tendon, or labrum damage must be considered and if found positive upon examination resulting in a referral to an orthopedic surgeon. Impingement syndrome potentially of the biceps, supraspinatus, subacromial bursa, posterior labrum, infraspinatus and teres minor. Acromioclavicular (AC) separations commonly known as "Shoulder Separations". Treatment at Pioneer Sports and Pain Center includes Graston Technique to help break up fibrotic adhesions that cause pain in the muscles and tendons of the feet. Along with exercises, stretches, and PT modalities in addition to the traditional chiropractic adjustment.